This is the last of three posts dedicated to the Second Annual Barrymore Blogathon being held over at In The Good Old Days of Hollywood. Tnx Crystal for letting me take part! 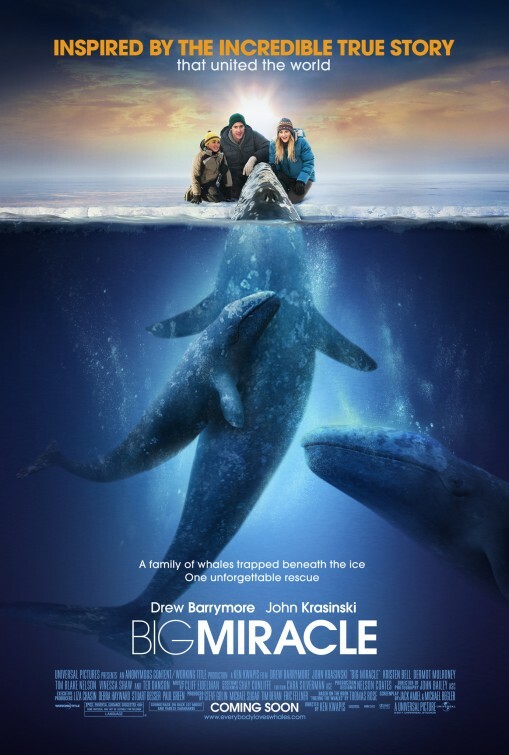 Brief Synopsis – A news reporter discovers three trapped whales in the Alaskan ice and his news report on the event snowballs into a National and International effort to save the three whales. Based on a true story. This is actually a film that I had never even heard of before doing research for this blogathon and I chose it because the premise sounded quite good. Unfortunately and fortunately, the premise of this film is quite good, but the performances are lackluster. What makes the film more enjoyable to watch though is not the human interactions but the heartwarming story of teh whales. Most of teh characters feel like cardboard cutouts and just “hang” around. None of the main actors stand out here and they are easily absorbed into the groups and groups and characters that are trying to save these whales. The irony of it all is that it’s extremely easy to care about teh whales but very difficult to care about the human characters. I liked how they give us some of the real footage from the actual event intermingled with the new shots created for the film. The special effects are quite good because it is extremely hard to tell that the whales aren’t real. What surprised me the most here tho was the fact that none of the three very talented lead actors here (John Krasinki, Kirsten Bell and Drew Barrymore) were able to take things up a notch and stand out here. Bottom Line – Very heartwarming story that rightfully makes us care much more about the animals than the people involved. Liked how we get to see some of the real footage from the time intermingled with the new shots. None of the actors really stand out here and the stories between most of the characters fall a bit flat. If it wasn’t for the joint efforts to save the whales, this film wouldn’t have much personality. Krasinski, Bell and Barrymore are all ok here, but none of them can help make this film even better.